Blue Hen New Year, New Project Resolutions! Hello all, I hope everyone had a wonderful holiday. With 2017 starting soon, here's some ideas to inspire your New Year's resolutions! 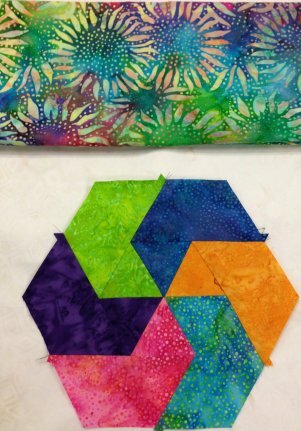 Learn something new with one or both of the two fantastic Block of the Month programs starting at the Blue Hen Quilt Shop! Get in on the beginning so you won't miss a thing! Or maybe you would like to stretch your imagination a bit with a little challenge. Keep reading - get inspired! Learn to make all sorts of hexagons with a 60-degree triangle ruler! Some are simple and some are three-dimensional! 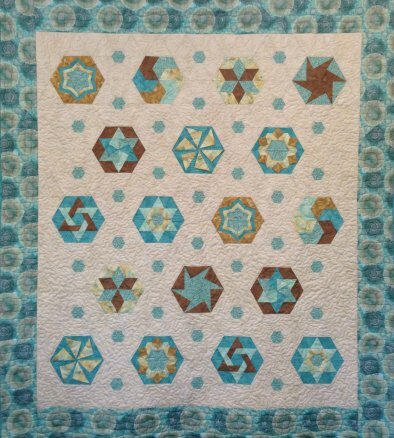 This fun piecing project starts January 11th. Nine blocks plus a Finishing Kit (backing not included) - 10 months total. The quilt finishes 67" x 76". And each block debuts with its own 3-hour class! You don't need to attend the class to participate in this cool project but if you want to, it's the 2nd Wednesday of every month 6 - 9 pm! All this for $19.95 a month. Two color ways to choose from - Beautiful teals and tans or bold batiks! Call or come in to the Blue Hen to sign up now! This stunning 10 month project starts in February! 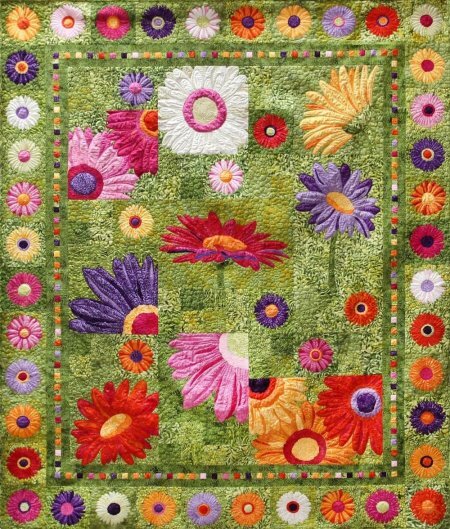 This 66" x 80" quilt uses thread painting and fusible applique! Start this project with Jody on Saturday, February 4th at 11am with the kick-off workshop! Nine months of fabulous floral blocks and then get back together with Jody for the finishing kit techniques! But remember, you don't have to participate in the classes to enjoy this spectacular Full Bloom project. Just $28.95 a month secures your spot. And are you up for a Challenge? The Blue Hen Quilt Shop challenges you to use either the green or blue version of this adorable fabric in a quilted item (quilt, bag, table runner...) Bring your finished quilted item back into the Blue Hen Quilt Shop by March 1, 2017. Quilted items will hang for 30 days in the shop and customers will be invited to vote on their favorites. The piece with the most votes will win a $100 gift certificate to the Blue Hen. Come in and see the fabric for yourself! The possibilities abound...! We hope to see you all in the coming New Year!